Analysts have been cutting target prices of stocks under their coverage post demonetisation, which is expected to slow down the economy and squeeze earnings growth. 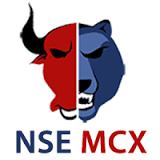 But, there are a few stocks, whose target prices have been upgraded amid the gloom. These are Nalco, Balkrishna Industries, Lakshmi Machine and Kaveri Seeds among others. 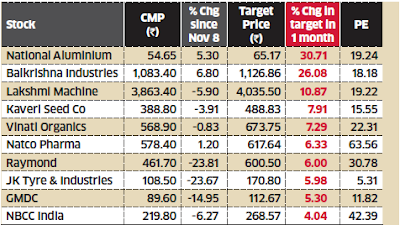 ET compiles a list of 10 stocks which can give 10-20% return over next one year based on increase in price targets. Balkrishna Inds Company reported an impressive EBITDA margin of 33.0% in Sept quarter. PAT grew at 57.4% QoQ and 145.2% YoY. "We believe despite pricing pressures in the tire market, presence in diverse geographies enables co to tackle certain market/economic shocks owing to their strong presence in the replacement market" said Jagannadham Thunuguntla of Karvy Stock Broking. Lakshmi Machine A healthy balance sheet with surplus cash of Rs 1,000 crore as of FY 2016. No debt on its book since FY 2005. Though Lakshmi Machine WorksBSE -0.05 % reported a muted performance, analysts expect the textile companies to do well in FY 2017. "The company is expected to generate higher free-cash flow, which may result in higher dividend payout", said Ankit Gor of Systematix Research. National Aluminum Sharp jumps in alumina prices and stable aluminium prices are likely to drive Nalco's performance ahead, according to analysts. "We cut our FY 2017 estimates by 12% to factor in Q2's signifi cantly weak performance. However, we raise our FY 2018 estimates by 30% to factor in higher commodity prices and we revise our target price to Rs 76 from Rs 60 earlier," said Dhawal Doshi of Phillip Capital. Kaveri Seed Kaveri dominates the cotton seed market in India and is gaining market share. It has also shown consistent performance despite challenging environment. "The outlook for FY 2018 looks brighter, given increase in cotton price and high probability of crop rotation in favour of cotton, augurs well for cotton acreage expansion," said Sathyanarayanan M of CholamandalamBSE 1.24 % Securities. Vinati Organics Vinati is the largest player for Isobutyl Benzene commanding more than 65% of the global market. "A well experienced and able management coupled with good growth in the Acrylamido Methylpropane Sulfonic Acid (ATBS) segment, driven by demand in the water treatment, projects a positive outlook for the company," said Praveen I of Cholamandalam Securities. Natco Pharma Natco expects to file about 6 to 7 ANDAs during FY 2017, has made considerable investments for new formulations facility at Vizag and to be completed by March 2017 and FY 2018 to Rs 8,080 crore and Rs 9,420 crore. Your blog is really very informative, Thanks for sharing this information.